Problems with brake systems can be difficult to diagnose and find out what exactly is happening with the parts. There are some things that you can look for that will tell you what part of the brakes are damaged and need to be replaced. If you have been feeling the problem in the steering of the vehicle, or there is a vibrating feeling in the brake pedal, you might have a problem with your brake system. Brake rotors are an important part of your brake system and should be replaced or machined when they are damaged. 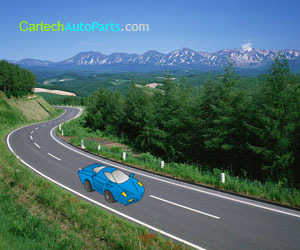 The brake rotors on your vehicle spin with the wheels of the car. The brake pads come into contact with the wheels when the brakes are engaged and both the pads and the rotors will become hot when the brakes are used. One of the problems that can occur with your brake rotors is warping. This occurs from the hot temperature that the rotors will reach while they are being used. After making a lot of stops as in heavy bumper to bumper traffic you should avoid driving through puddles and snow to prevent warping of your brake rotors. The warping occurs from the hot temperature and then the very sudden drop in temperature on the rotors. This can also occur when you wash your vehicle after driving for a long distance with frequent stops and starts along the way. Damage can also occur to your brake rotors if you drive with your foot on the brake. Many people have this bad habit and it will cause the rotors to have constant contact with the brake pads. Over time the pads will wear down and the rotors will become hotter while working. This can cause you to replace your entire brake system. Your brake rotors can become damaged if you are travelling down steep roads with a heavy load. For instance, if you are towing another vehicle or trailer and travelling down a very hilly road, you will apply your brakes more frequently and cause damage to the rotors. When you are applying the brakes in your car and feel that the car is pulling to one side more than the other, you may have a problem with your brakes and rotors. If the rotors become too damaged, you may have to repair or replace the calipers as well. Change your brake fluid to avoid damage from overheating brake fluid in the system. If the fluid is bad in your vehicle, the car will become dangerous to drive because of poor stopping capability of the braking system. Bad rotors or warped rotors will sometimes make a sound when the brakes are applied. If you feel a vibration in the driver’s seat of the car while you are applying the brakes or you hear a sound when the brakes are applied, the brake rotors should be checked. Replacing the brake rotors in your vehicle can be a relatively inexpensive repair if you do the work yourself. There are some brake rotors and systems that will cost a great amount of money. These are generally used in very expensive vehicles. One of the most important safety features in your car is your brake system. It is important that you pay attention to the signs of damaged brake rotors and decreased ability to stop the vehicle. You should make sure that the brake fluid is changed frequently and that it does not become too low before you drive your vehicle. To make sure that you stop safely while driving your car, you should have the brake system checked routinely to ensure that everything is in working order.